This article was originally published in the newsletter of our MTAM member firm, Logic Solutions of Ann Arbor, and was written by a member of their Marketing team, Louie Davis. The article is reprinted here with the firm’s permission. The Mobile Technology Association of Michigan (MTAM) is a strong advocate for the use of mobile / wireless technologies in every business vertical. This article does an excellent job of helping to increase awareness of the capabilities of those technologies in the business environment. At the turn of the decade, technology analysts and investors bet that enterprise mobile applications would revolutionize business activity akin to the way they changed social and consumer behavior. In the past two years, enterprise mobile applications have gone viral. iOS and Android device adoption is growing 10 times faster than PC adoption did in the 1980s. 88% of organizations surveyed by IBM currently offer, or are expected to adopt, mobile versions of websites AND mobile apps in 2013. According to Forbes, 94% of Fortune 500 companies are testing or deploying iPads. By 2015, mobile app development projects will outnumber PC projects by a 4-to-1 ratio. Mobile business apps for smart devices are a permanent and increasingly large piece of the business IT puzzle, not a transient fad. Executives from every corner of the economy recognize a powerful upside to mobile technology, and they’re investing accordingly. 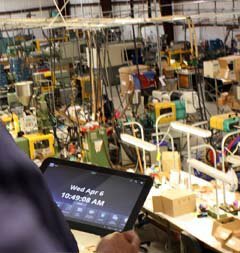 Whether you work in a hospital, a factory, a classroom, or a retail store, employee-facing mobile apps are workforce productivity engines, making every day responsibilities and processes more efficient. Mobile business apps can increase a company’s overall productivity and reduce labor, materials, and operating costs. Early adopters of internal-facing mobile business apps are already enjoying increased productivity, reduced paperwork and increased revenue thanks to streamlined workflow and communications. Similarly, with nearly 120 million Americans owning a Smartphone and 22% of adults owning tablets, customer-facing mobile apps are equally gainful. This channel offers exciting long-term opportunities for companies to extend their brand, deepen B2C and B2B/B2R engagement, and generate revenue. But before your company can realize ROI from employee- or customer-facing mobile app, you need a well-mapped mobile strategy. Why is the app being developed? Define the pain points your app will be designed to alleviate. Detail your expected return on investment, whether that be in cost savings from streamlined processes, increased sales from reaching more consumers, creating brand awareness and engaging a larger audience, improving communications, etc. Understand at the outset what makes your investment worth it to you, then build from there. Who will use the app? Employees? The general public? Account holders? Partners? Independent Reps? Retailers and distributors? Fans and subscribers? All of the above? It is imperative for businesses to understand their target audiences through careful analysis and measurement. By understanding these connections, the mobile app’s strategic focus will sharpen. Choosing a mobile development approach is highly contingent on your audiences’ device tendencies. Reaching the broadest audience is obviously best, but sometimes budget can be a limiting factor in deploying on multiple platforms. Do your users prefer iOS, Android, or both? Smartphones and/or tablets? If you are creating an app for internal use, does your company have a Bring Your Own Device (BYOD) policy, or does it plan on issuing common-platform work-only devices for employees? Knowing what your app will do might be the easy part, and you’ve probably had that idea in your head from the beginning. Fleshing out how it will do it can get trickier. Will your app require and/or function best on a smartphone or tablet? Will your app require internet access? Do you need to retain the information that is being transmitted? Do you need the app to talk to other IT systems? Are there security issues? One of the biggest questions is this: mobile web or native app? Mobile websites are traditional websites that have been optimized for the small screens sizes of smartphones and tablets. They look like apps, but are accessed through the device’s browser, using your existing URL. Mobile web’s strengths lie in its cross-platform nature, its searchability, its relative ease-of-construction, and content delivery: it simplifies navigation by highlighting the most critical information to your visitors and customers. Native apps are more appropriate for workforce productivity solutions and deeper marketing and customer engagement possibilities. They provide a “stickier” engagement experience and can also draw on native device capabilities and other options for increasing productivity, loyalty and monetization. Some of these features include data integration, GPS location functions, image manipulation, forms and surveys, event planning, content management, VOIP, and much more. Additionally, they may not require a constant Internet connection to operate. Native apps are usually a more substantial investment than mobile websites. Programming is more sophisticated, and may need to be done in separate languages for different platforms. However, new tools are making cross-platform development less expensive than ever before. The mobile tipping point is here: thousands of companies—big and small—are already capitalizing on the ability of mobile business applications to increase workforce productivity and to reduce their labor, materials, and operating costs. Thousands more are using them to deepen customer engagement, brand loyalty, and to generate revenue. In order to capitalize on this potential, understanding your full range of business software options is important. The Mobile Technology Association of Michigan (MTAM) is a Michigan-based non-profit trade association for the mobile / wireless industry. Our mission is to grow the industry within the state by increasing demand for Michigan-based mobile / wireless technology products and services, thereby generating increased entrepreneurial and enterprise-level opportunities and creating sustainable jobs for Michigan residents. MTAM sponsors Michigan-based growth of the Mobile Monday organization which to-date boasts 2300+ members in chapters located in Ann Arbor, Detroit, Grand Rapids and Lansing; performs research for members and other interested parties; facilitates idea sharing, entrepreneurial programs, training programs and jobs creation; acts as a liaison with the mobile / wireless technology community inside and outside of Michigan; and serves as a resource for all things related to the mobile / wireless industry. MTAM’s website can be found at http://GoMobileMichigan.org.